Staffing the right candidate for a job opening is a daunting task. HR personnel typically spend anywhere between a few weeks to several months sourcing applications, evaluating candidates, shortlisting individuals, etc. This effort is tantamount to finding the legendary needle in a haystack. Staffing the right candidate for a job opening is a daunting task. HR personnel typically spend anywhere between a few weeks to several months sourcing applications, evaluating candidates, shortlisting individuals, etc. This effort is tantamount to finding the legendary needle in a haystack. Recruiters and HR teams, as on date, have to still manually sift through tomes of applications to shortlist the right candidates. Industry averages estimated that HR teams spend up to 85% of their time on such administrative activities, and only c.a. 15% on strategic value-adding activities central to their organizations. Through Big Data Analytics, many of these chores could be automated and holistic evaluation of candidates’ profiles performed by aggregating datasets that cannot be manually performed. Such an approach has the potential to shorten the recruitment cycle and free up the HR departments in many organizations for strategic growth initiatives. Though companies have been leveraging data for strategic and operational decision making for decades, recruitment is an arena that has made only limited strides. Privacy laws, regulations and governance structures have traditionally restricted companies from using applicants’ online data in the recruitment process. Therefore, companies were obliged to restrict their scope of evaluation to the static, and often times, unrepresentative information furnished by applicants in the form of Cover letters, Curriculum Vitae and other similar transcripts. Many hiring managers do, however, unofficially review shortlisted candidates’ online profiles to gather further insights. The resulting interpretations are based largely on the HR personnel’s biases and predispositions, which may, at times, work against excellent candidates. Hence, it is clear that such attempts are neither efficient, nor effective at achieving ultimate recruitment objectives. In addition to the above challenges, the HR departments in most companies are vastly understaffed. The sheer volume of candidate applications overwhelms the HR personnel that it is humanely impossible to perform a meticulous analysis of all applications to select the right candidate. In some cases, HR personnel have even resorted to random sampling to shortlist candidates from the applicants’ pool.Furthermore, as most applicants already know, HR personnel typically spend only 2-3 minutes per application on an average. Hence, candidates convey only the most essential information to align with this short time window of perusal. As almost all candidates resort to the same approach, their applications become indistinguishable from one another. Though these realities showcase a bleak scenario, the recruitment landscape is gradually changing as social networks and portals, such as Glassdoor and other social career portals, are eliminating information asymmetries and empowering job applicants and HR personnel alike. Furthermore, both the companies and candidates are increasingly acknowledging the potential benefits of Big Data in recruitment and are more open to embracing technologies to that extent. Today, almost all applicants have a comprehensive digital footprint that almost completely captures an applicant’s characteristics. Most applicants belong to one of more professional and / or social networks, participate in eGroups and communities, run a blog, etc. Much of the information shared on these channels capture a candidate’s inclinations and behavior online over a significant period of time. Such online data captures a candidate’s interests, leadership traits and standing in a social network, affiliations, behavioral traits through peer interaction, collaboration characteristics, teamwork, etc. These online signatures are distinct across individuals, so could make a more reasonable differentiator among candidates in the applicants pool. 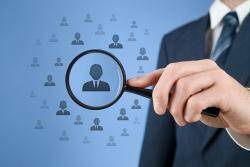 HR personnel could leverage this information in identifying the right candidate. For example, consider an opening for a Social Media Marketer at a firm. Almost all job candidates will share similar educational and professional qualifications, experience in online marketing, belong to social network(s), etc. Despite these common denominators, an applicant with a Klout (www.klout.com) score of over 60 is probably better networked with a higher “influencer” potential than a candidate with similar qualifications, but with a lower Klout score. Klout scores quantify social media interactions and a good score is usually earned over a period of sustained interaction with other individuals. So, a candidate with a higher Klout score has a higher probability of success as a Social Media Marketer than one with a lower score. Similarly, a Data Scientist with a pedigree of participation and wins in Kaggle (www.kaggle.com) contests would most likely have earned the credibility as a Subject Matter Expert and have a significant standing in the community. Such accolades, which summarize social, behavioral and functional qualifications, are more representative of a candidate’s credentials, which help HR personnel identify the right candidate for the position they strive to fill. Though we are at the very beginning of the Data Era, there is no doubt that Big Data Analytics could eventually deliver the benefits it promises. Through HR Analytics using Big Data, Key Performance Indicators or metrics relevant for the company or the job opening could be defined and the corresponding data automatically sourced and used to identify the right talents in real time. The chosen metrics could be also be represented visually pleasing dashboards; such a framework could include data points that cannot be manually processed by humans, establish statistical significance among metrics, reveal correlations and insights from data and also present further evaluation metrics that recruiters may potentially have overlooked or were unaware of. By attributing relative weights to the various metrics, an objective candidate selection decision could be made. These metrics and systems, no doubt, proffer immense benefits to the HR personnel. However, one has to keep in mind that overuse of such a framework could only lead to abuse. A conscious, well-informed and structured approach to recruitment practices, solid corporate HR policies, adherence to the legal predicates around data privacy, etc. are important considerations a firm has to make before employing Big Data Analytics in HR practices.